Price Marking labels with double slit tracking for single line MX5500/ EOS price labeling guns. Plain White and rectangular. 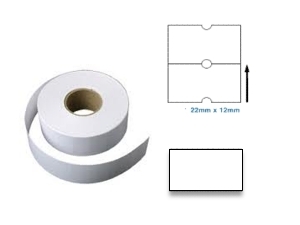 This label is ideal for either Batch Coding or Price Marking . 1000pcs per roll. The high quality adhesive applies to plastic as well as cardboard and is durable even under cold storage conditions.